Air Date: 11/05 – this only has five matches, so it’s probably the one show taping we were looking at. 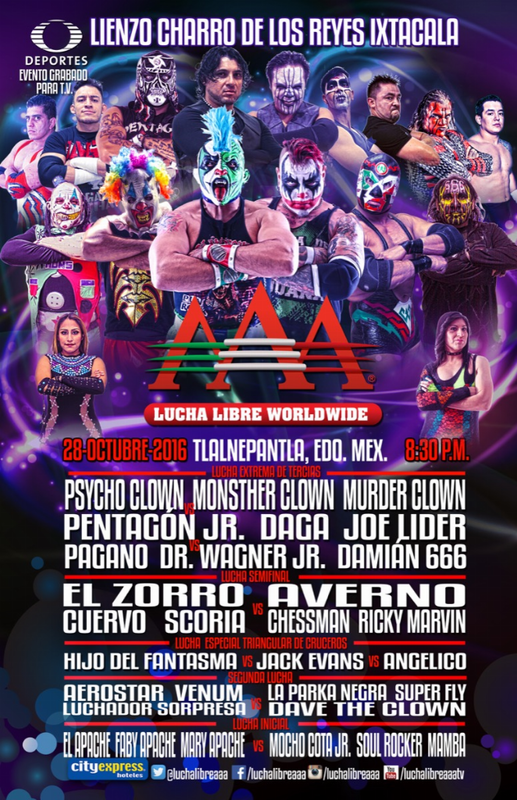 Even with it not being as long as usual, this means AAA’s announced the next seven weeks of TV (TripleMania part 3, Hard Rock, Heroes Inmoratles Part 1, Heroes Inmortales Part 2, Tlahuelilpan 1, Tlahuelilpan 2, and Tlalnepantla). The main event is listed as an extreme match, but when do those guys not have an extreme match? Xinetez/OGT rematch on this show, so that’s a program – and the Apaches are around. That three way trios match seems more likely. Venum is still around! Possible. That other spot would normally go to Ludxor, but he’s not in AAA and it doesn’t sound like he’d be able to wrestle at this point anyway. There’s long been talk about moving Dinastia up to the main division, and maybe this might be it, though Dave the Clown on the other side will make that harder. It’s September, but AAA’s getting down to the last few tapings to announce. There’s probably a taping the first week of November. A Ciudad Juarez newspaper announced a taping on 11/20 (but that was month ago and so it always subject to change.) Guerra de Titanes is probably a couple weeks after that, and they could bring back the late December taping if everything goes as scheduled.